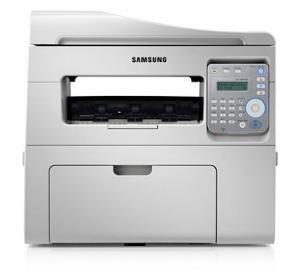 The stylish Samsung SCX-4655FN is a good addition to small offices. This function unit can print, copy, scan, and fax. Best of all, it offers the convenience of an 'eco mode' to lower running costs. The Samsung SCX4655FN can deliver output with a maximum resolution of 1,200 x 1,200 dpi and can handle 12,000 pages per month. It has a 128 MB memory and is equipped with 433 MHz. This unit does not offer an automatic duplexer, however. Sleek and compact, the Samsung SCX-4655FN comes in all white and has a flatbed scanner with a 40-sheet automatic document feeder, plus paper trays that can handle a total of 250 sheets. The SCX4655FN measures 410 x 388 x 295 mm and weighs 9.7 kg. Print speed can go as fast as 24 ppm, with the first page coming out in 10 seconds or less. Ethernet and USB ports are available. This multifunction printer is very handy as it offers advanced features for faxing, scanning and copying, including the ability to send to multiple recipients, scan to PC, and automatic resizing and sorting of copies. The SCX-4655FN is easy to share in a workgroup as it has built-in Ethernet and is compatible with Macintosh, Linux, and Windows. This unit can continuously copy up to 99 pages and it offers a maximum resolution of 4,800 x 4,800 dpi for scanning. Double-sided printing can only be done manually. Disappointingly, the Samsung SCX-4655FN does not include a Wi-Fi connection.